As some of you know, I have a particular weakness for milk chocolate, so when find me a gift offered some chocolates from Martin’s Chocolatier to review, I chose the Milky Moody Selection. The website looked promising, stating “handcrafted luxury chocolate collections”, sourcing “only the finest luxury chocolates from around the world”. There was a bit of a delay in delivery, so to assuage my chocolate deficiency, I was very kindly sent these delightful little shoes. I fell in love with them on the spot and could not bring myself to spoil their perfection by tucking into them. They are currently decorating my sitting room, but I have plans for them to top a forthcoming cake – just perfect for creating a wow factor, or so I’m hoping. 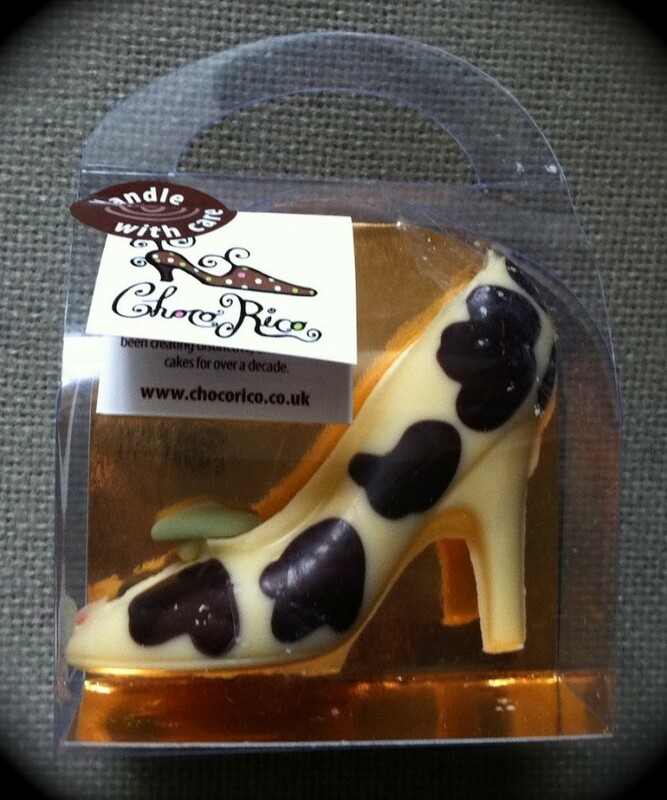 They would make a great stocking filler for a sweet toothed shoe lover. The chocolates eventually arrived. At first glance, they looked to be quite interesting and I was looking forward to trying them – who am I kidding, when do I not look forward to chocolate? There was a good range of flavours and fillings and they weren’t all the usual suspects. The names were unusual too: Beethoven, Moulin Rouge & Edwina to name but a few. But there was no explanation as to why they were so called. On the box, these are described as “Finest quality chocolates. Ultimate taste experience”. Sadly, I did not find either of these statements to be the case. I should have been warned by the lack of information provided; in my experience good chocolate comes with a story. Not only was there no explanation of the unusual names the chocolates had, but there was nothing about the producers or where the cocoa had come from – in fact there wasn’t much more than a list of ingredients and an address. The milk chocolate (30%) tasted cheap and left a greasy feel in the mouth long after the chocolate was eaten – the result perhaps of the vegetable fats listed in the ingredients. Finest quality chocolate? I don’t think so. With a few exceptions, I found the fillings bland and insipid. No, I was not enthused at all and unusually for me, had no problem putting the box aside. To be fair I have a cold, so my taste buds are not on top form. This being the case, I am willing to be convinced that the fillings are better than I’ve stated, but the chocolate I can find no excuse for. On the plus side, these chocolates were not sickly sweet nor were the flavours artificial – in taste and actuality. Overall though, these are disappointing. I have eaten some good chocolate in my time but these were not of that ilk. At £25 for 30 chocolates (360g), I do not believe these to be good value for money. A better quality milk chocolate is needed and that would go a long way to improve the “luxury” status of these chocolates. Rhapsody – creamy raspberry flavour with a layer of jam. This was the first one I tried and I was very willing to be rhapsodic, but alas, the jam was the only flavour I detected. Christina – soft smooth belgian caramel filling. The caramel had a nice flavour and a good consistency, neither too runny nor too firm. Melissa – smooth orange parfait. This had a good zesty orange flavour to it and the ganache was nicely smooth. Mary – smooth Irish cream. This was quite enjoyable, but only tasted very faintly of Irish cream and I could detect no presence of alcohol. Captain Cook – dark rum ganache. Rather cloying and a bit too sweet, this had a hint of rum about it but without the heady notes you’d expect in a proper rum truffle. Arabica – roasted coffee praline. With CT not around to do the coffee tasting for me, I gamely gave this one a go. Surprisingly, I enjoyed this one more than most and I think it’s because I could actually taste something distinctive. Edwina – almond royal marzipan. I’m not sure I’ve ever eaten marzipan that I haven’t enjoyed and this was no exception. A nice generous chunk of chewy marzipan covered in only a thin layer of the chocolate – which was a good thing in this instance. Moulin Rouge – white chocolate ganache with forest berries. One of the better flavours where the berry taste came through clearly, but was muddied by the chocolate. Eve – soft centred cream of green apple. This was the one I was most looking forward to trying, but it turned out to be the most disappointing. The filling had dried out and shrunk and the chocolate beneath it had collapsed. The only flavour I tasted (apart from the not particularly chocolatey chocolate) was from the coconut decorating the top. Beethoven – soft butter cream with gingerbread. This one sounded so good and warming and just right for Christmas. I liked the texture of this, very smooth, but with tiny bits of gingerbread which made it slightly chewy. This left a nice warming taste in the mouth, though I would have preferred a slightly stronger flavour. An excellent and helpful review ~ well done Choclette! I love the photographs – really helpful and I actually think I would prefer the non alcholic taste of the Irish cream one! Shame about some of the chocolates, hope it’s better next time! How disappointing, I love chocolates and just hate it when they fail to deliver a great taste. I hope the shoes are worth the wait, but at least they are pretty to look at! I love those little shoes, they are so cute! What a shame that the overall box of chocolates didn’t live up to expectations. Gosh, these chocolates bring back memories – especially the rum keg shaped ones. Thanks for doing such a tasting for us – will this be a regular feature? I mean, how many boxes will you need to get through for us all? 😉 Fantastic! Gutted. They look really nice. That’s a shame, but thank you for your honest review. I thought the shoe looked beautiful! These looked really delicious. Such a shame. I wonder if they were a bad batch.